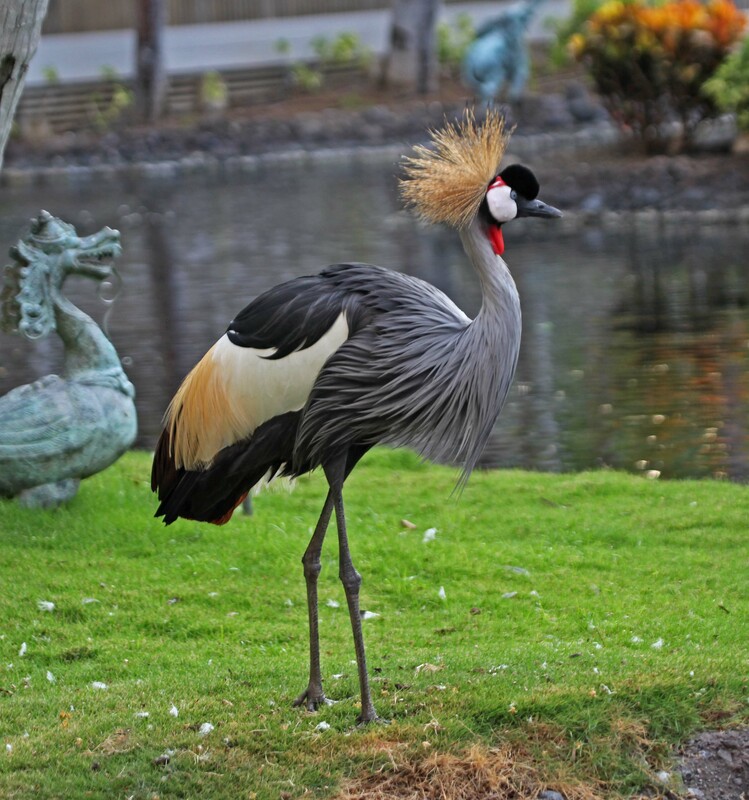 The Grey Crowned Crane is also known as the East African Crowned Crane. 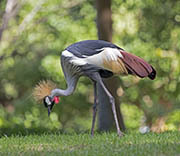 They are found in Africa and they are the national bird of Uganda and features in the country's flag and coat of arms. 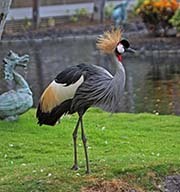 They are very similar to the Black Crowned Crane. 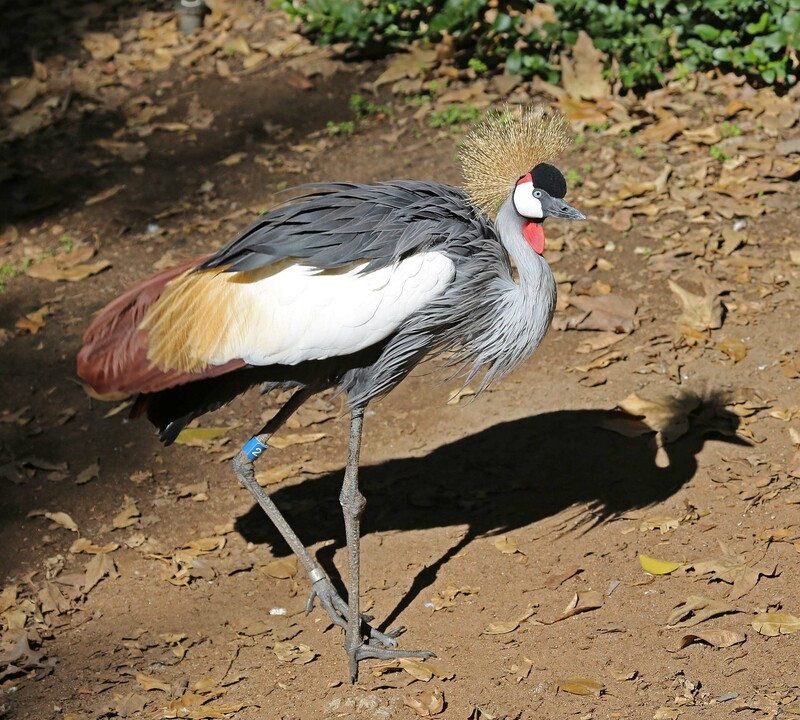 There are two subspecies of Grey Crowned crane: the more abundant East African Grey Crowned Crane (Balearica regulorum gibbericep) and the South African Grey Crowned Crane (Balearica regulorum regulorum). (I only have pictures of the East African subspecies.) The two subspecies can be visually distinguished from each other by the size of the red skin above the white cheeks. The Eastern subspecies has a larger bare patch of red facial skin above the white cheek patch. Sexes are similar in each subspecies. Both subspecies have the distinctive golden colored spiky crest, grey body, large white wing patch, long grey neck with a black head with white cheeks and a red gular sac. The legs and feet are black and the bill is short and dark gray. Juveniles are greyer with a feathered buff face. Chicks are greyish rufous with pale pinkish legs. Diet: Like all cranes, they feed on insects and other invertebrates, reptiles, small mammals, as well as grass seeds. Farmers consider them pests because they will graze on cultivated crops such as soybeans and rice. 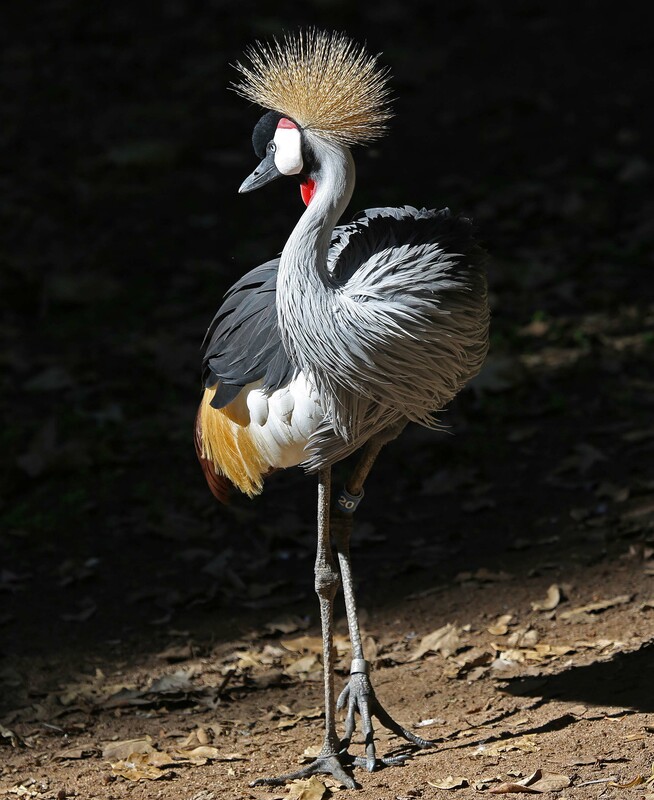 Courtship: The Grey Crowned Crane has a display that involves dancing, bowing, running, jumping and stick tossing. 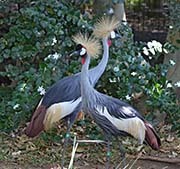 This display is believed to be part of the courtship ritual and may also reinforce the pair bond. Younger birds also 'dance' and the reasons for this may be to help with motor development and to relieve aggression and tension. Grey Crowned Cranes are monogamous birds that pair for life. Pairs will stay together even in the middle of a large flock. 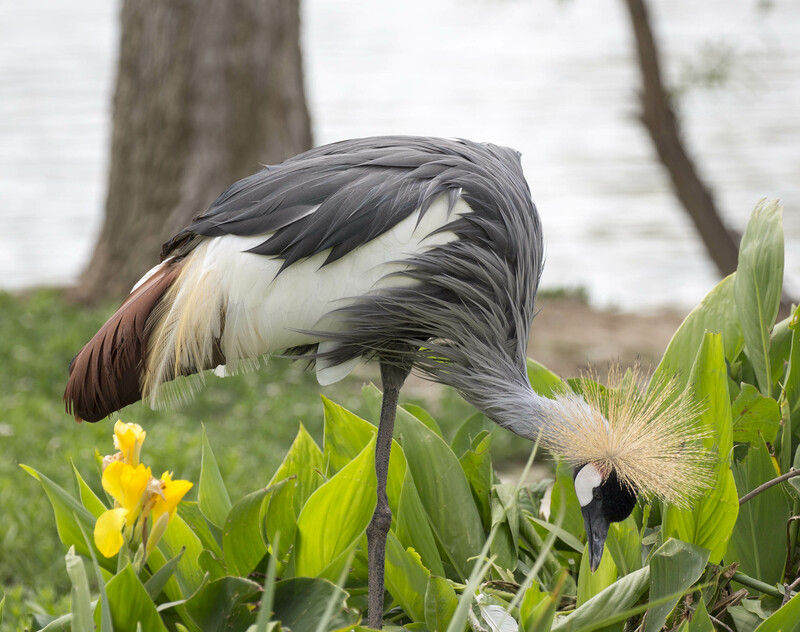 Nesting: Both sexes build the nest which is a circular platform of grass and other plants in tall wetland vegetation such as marshes, swamps or flooded fields. 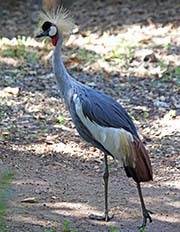 They are also one of only two crane species that will occasionally nest in trees (the other is the Black Crowned Crane). The female will 2-5 eggs and both parents will incubate and feed the chicks and will defend the nest aggressively if needed. The chicks are precocial and hatch with down feathers, open eyes and can leave the nest soon after hatching. Habitat and Range: The East African Grey Crowned Crane is found in Kenya and Uganda south to Zambia and Malawi. 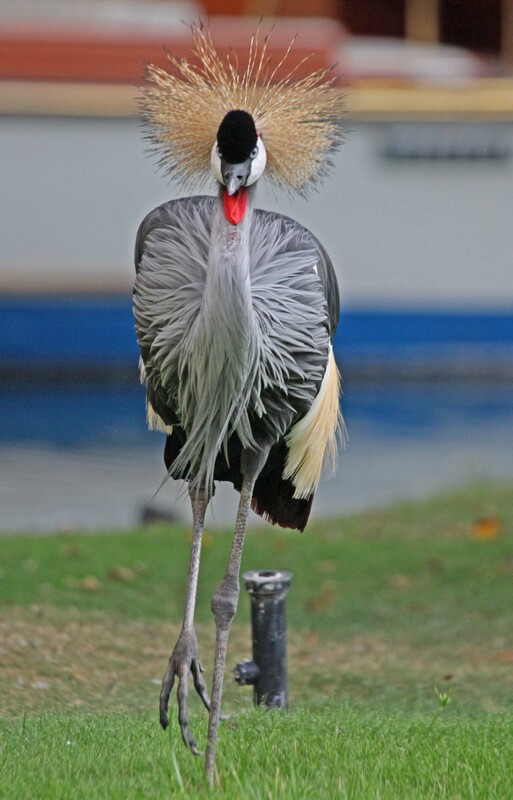 The South African Grey Crowned Crane is restricted to South Africa and Zimbabwe. They nest in or on the edges of wetlands and will forage for food in the wetlands or nearby grasslands and croplands. 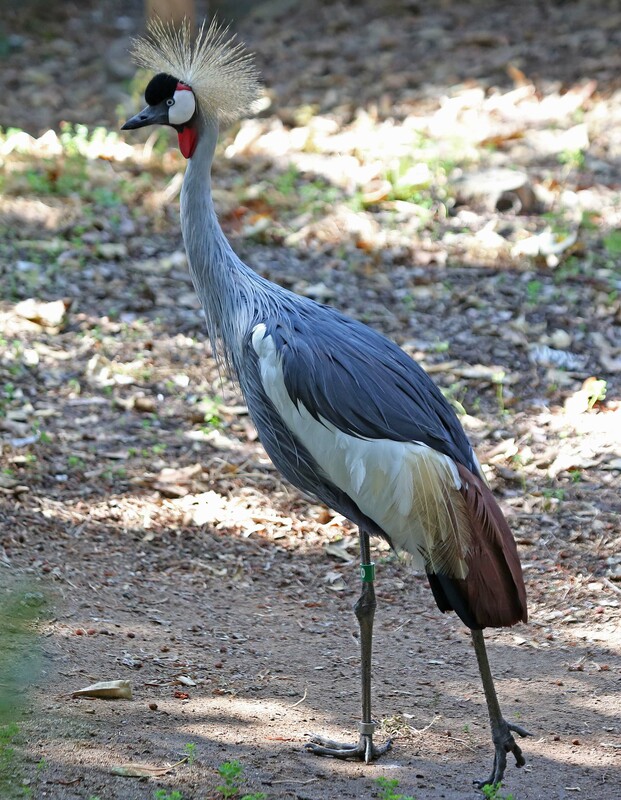 Vocalization: It has a booming call which involves inflation of the red gular sac. 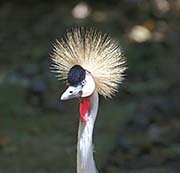 It also makes a honking sound quite different from the trumpeting of other crane species. Plumage/Molt Like most cranes, molts annually during the post-breeding season. The flight feathers are lost gradually so they do not experience and extended flightless period. 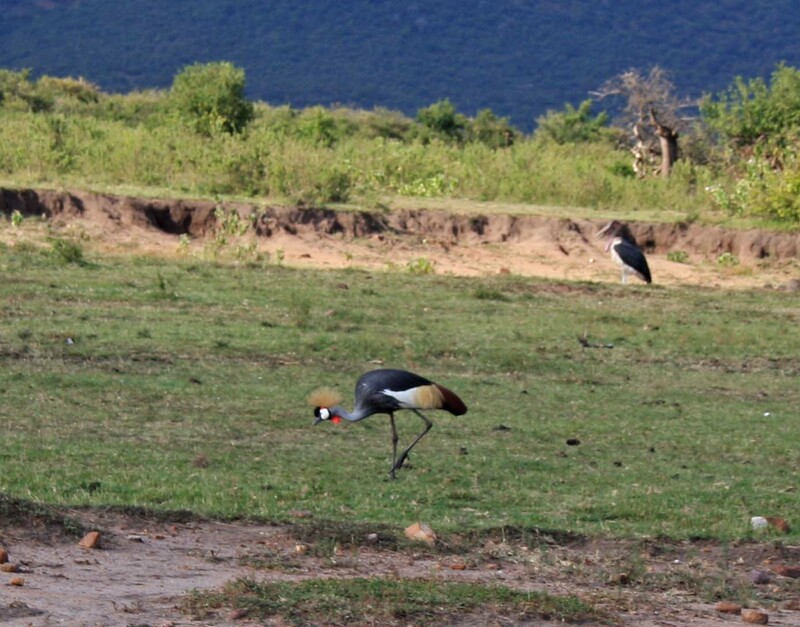 Migration: Grey Crowned Cranes do not migrate. 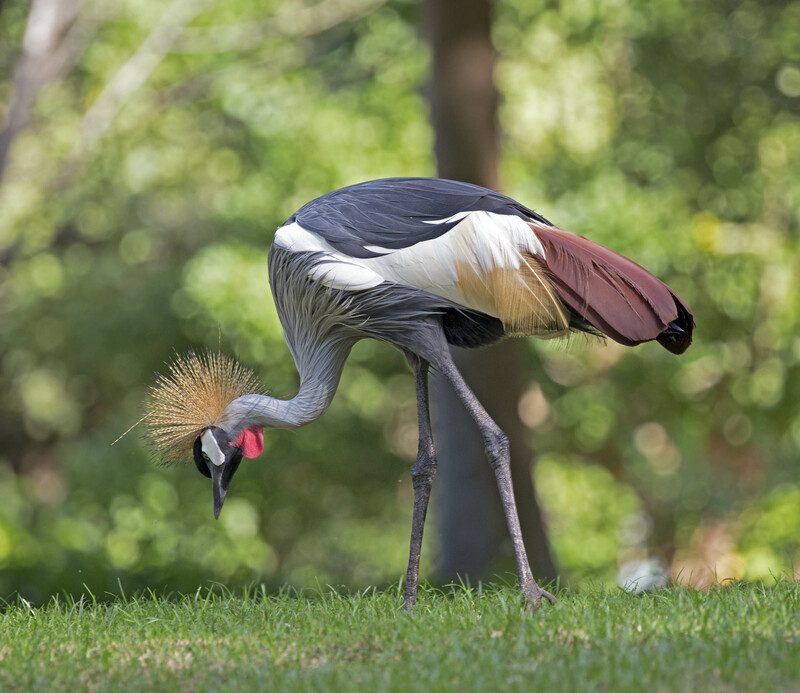 Tongue/feet: Grey Crowned Cranes and Black Crowned Crane are the only cranes that can roost in trees. They have a long hind toe which can grasp branches.